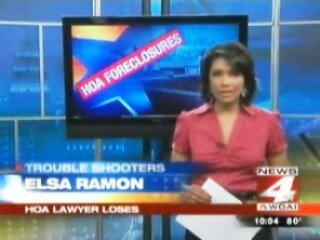 SAN ANTONIO-The News 4 WOAI Trouble Shooters' recent investigation into skyrocketing foreclosures by homeowner associations struck a nerve. Because of the spotlight we put on the problem, many homeowners are demanding lawmakers stop HOA's from taking homes because of unpaid dues. Most of these foreclosures are filed by one attorney, Tom Newton. 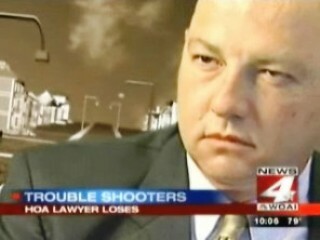 He represents almost all the HOA's in San Antonio. If your home is on the auction block, there is a good chance he is the guy you'll have to deal with. But that didn't scare off homeowner Kent Hern. 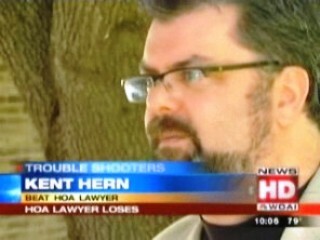 When the HOA foreclosed on Hern because he owed a couple hundred dollars, he took them to court. Hern lives on the north side of town in the Hidden Forest subdivision. He fell behind on his HOA payments a few years ago while he was out of the country on business. No matter, Newton still filed the papers with Bexar County to take Hern's house. "He's the ringleader for attorneys who foreclose on homes for HOA's," says Hern about Newton. "When I saw there was a number of HOA's that had actually taken these steps to foreclose on homeowners for such ridiculously small amounts of money, we just decided that I was going to fight it because it just wasn't fair," he added. A Bexar County jury agreed with Hern, saying the HOA and Newton engaged in "unreasonable collection practices" while foreclosing on his house over such a tiny amount in unpaid HOA dues. The jury also thought the massive amount of legal fees added to the dues was completely out of line. Hern was awarded a total of $22,000; $11,000 of which was to cover his attorney's fees. Hern's attorney, Peter Kilpatrick, took Hern's case because he's tired of seeing people lose their homes over something so small. "This is a message to those HOA's that even though homeowners should pay their assessments, and on time, when they don't, they have rights too and they should not be plowed over with these gestapo-like collection tactics," explained Kilpatrick. Kilpatrick says part of the problem is in the contract the HOA's sign with Newton. It says the HOA is not allowed to accept past due payments from homeowners without Newton's approval. HOA ATTORNEY TOM NEWTON, Esq. of foreclosure against somebody's home, should not give up that power. Abdicate that responsibility to collection lawyers," explained Kilpatrick. "Something has to be done to either change this law or to discourage the HOA's from taking these ridiculous measures to put people under thousands of dollars of debt for just a couple of hundred dollars of association fees," pleaded Hern. We tried to contact Newton to see if he would like to comment on the verdict, but he has not responded. If you'd like to read the jury verdict and see Newton's HOA contract, click on the links.